FightingArts.com - Meditation: Just Do It! Editor’s Note: This is the second of a three-article series on meditation (Zen) and the martial arts. This article examines some of the techniques and methods of meditation itself. Part one, “Holding Hands With Zen: The Martial Arts Connection - An Interview With Jeff Brooks” discusses how Zen complements the martial arts by helping to develop total concentration without thought, something that allows greater spontaneity of action. The third article in this series, “Fighting Zen – How Mediation Can Enhance Your Fighting Skills,” by Christopher Caile, will discuss how Zen skills are actually put to use in fighting and self-defense situations. The traditional descriptions of meditation in the Buddhist tradition are many and varied. But they all share some aspects. In our tradition, our practice of shikantaza, or "just sitting," we withdraw our senses and allow our minds to settle down. We sit with legs folded, on a round cushion (zafu) which elevates the base of the spine slightly above the knees. We keep the spine tall, not leaning left or right, forward or back. The head is high, not tipping over. The tip of the tongue touches the back of the top teeth. Other alternatives for sitting are to kneel (seiza) with the aid of a short bench (seiza bench) to elevate the hips, or to use a chair for those with physical limitations. There are esoteric explanations for all of these elements, but they all have ordinary practical functions. For example, the tongue position allows our swallow impulse to subside, so we can sit more peacefully. The eyes are neither all the way open nor all the way closed, just half-open and cast down about 45 degrees, with a relaxed gaze. The hands are cupped, left inside the right, the thumbs touching lightly to form a small circle, with the arms resting on the thighs. Some people find it difficult at first, but after a while it becomes natural. This posture is very stable, allowing you to enter a relaxed physical state without tipping over. In our style we sit facing the wall, which minimizes visual distraction. 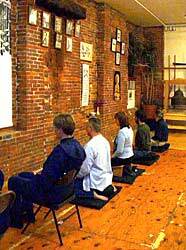 In other styles people sit facing one another, or in rows facing a teacher or altar. The environment in which we meditate ought to be without too much stimulation - it should be quiet, not too bright or too dark, not too hot and not too cold, without strong odors or perfumes, and without the likelihood of disturbance from people or animals. We should avoid moving - in order to scratch and itch or to relax a muscle - because the sound of us moving may distract others, and also because it stimulates our own sense of touch. If you let it, the urge to move will subside and you can sit very deeply. We make an effort to withdraw the five senses of perception so that we let go of our habit of grasping at sight, sound, smell, taste and touch. We also withdraw our mental grasping at thought. That is: we just sit. If, when you are sitting, you notice that your mind is slack and you begin falling asleep, don't yield to it, just sit strong and tall. If you notice you are agitated and fantasizing, planning, remembering and so on, let it go ("open the hand of thought") and just sit. That's it. 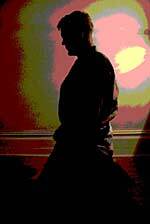 Members of the Northampton Zendo come together on Monday nights for group meditation. The room doubles as the Northampton Karate Dojo, and the important idea of "karate and Zen as one" is evident in the way Buddhist calligraphy and images shares wall space with photos and images related to karate. This may sound too simple to be profound. Many meditation traditions teach other methods. These other methods are all different from "shikantaza" (Japanese for "just sitting") in that they provide for an object of attention. That is, they give you something to think about (focus on) or something to do while meditating. A mantra (sacred phrase), a visualization, a sound, the breath (or counting breaths trying not to lose focus), various good ideas and so on for the object of attention during meditation practice. The mind focuses on one of these and in making an effort, the person's attention becomes more stable, clearer and more enduring. In shikantaza there is no object of attention. This is especially disconcerting and it leads people to ask what we are supposed to "do?" Just sit. But what does that mean? Don't daydream, don't fall asleep. That's it. But what do you DO? Just sit. In shikantaza the emphasis in the explanation of the method of practice is placed on what you don't do. To come face to face with the way our minds influence and distort our reality, we dispense altogether with objects. If you tell someone what to do, what to focus on, what to aim at, you simply give them a new object to hold onto. Many styles of meditation use objects of attention in practice. But in our style we do without them. This is difficult. But it is a direct path to the realization of the nature of reality. This is a subject worthy of exploration, especially when we realize that almost everything else we do or have ever done contributed to anxiety, unhappiness, anger or confusion. A future article will explore the alternatives to the samsaric worldview more deeply. In that article we will look carefully at the idea of samsara: a mistaken view of reality which traps us in the endless pursuit of things which we believe will make us happy but which bring dissatisfaction and disappointment instead. I would like to thank Christopher Caile for two of the photos that accompany this article.